Skip over the part about the scary and caustic drain openers! Go to the really useful portion about the right way to use a plunger to unclog your sink! (Click the picture to view the video). 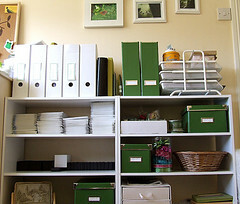 This article has a dozen great ideas for organizing your space in 2011. Tip #1 is especially good. Which tip is your favorite? Read the article on the Zen Habits blog here. The author of this very interesting piece is very clear about what she likes – and doesn’t like. One thing she does NOT like is cleaning! She makes the conscious choice to buy a smaller house, so that she can still afford to have her home professionally cleaned. No reason to feel guilt! 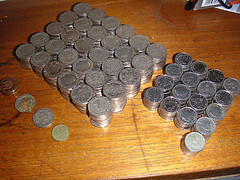 Best money I’ll ever spend. Some women try to do it all — work themselves to the bone at the office and at home, find time for their husband, run the kids to activities and maybe find 15 minutes to soak in a bath. Or they’re forced to. I’ve got options: If I work a little harder each week, I can afford to pay for the cleaning lady myself. And that means freedom. You can read the entire article on the shelterpop website by clicking here. 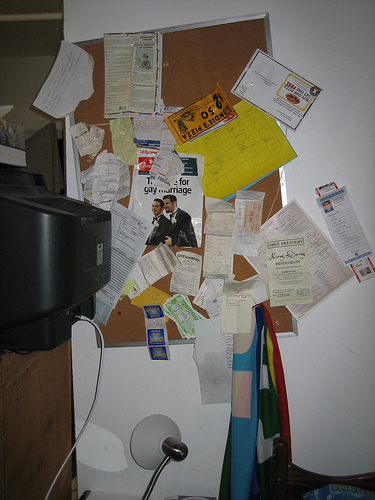 You may be disorganized because you are a visual processor. You LIKE to be surrounded by a mess because it is stimulating – and it reminds you to do your work. But it backfires, since you waste a lot of time searching for things. Try this solution: Separate papers into a pile you need to do and a pile you can think about doing. Use folders or boxes in different colors – that way your stuff is organized but you are still visually stimulated. Set up a system that works for you, and start with basic steps, like putting your keys in the same place everyday.